In North Carolina, it is a generalization that on maps prior to desegregation in the 1950s, poorer neighborhoods seem to have been located primarily in the eastern part of its cities with Charlotte being the exception. It has found its way into popular mainstream culture such as singer-songwriter Lucinda Williams current alt country hit, East Side of Town. There is a theory that this occurred because winds come from the southwest during all but two months, waterways generally trend southeast and people of means lived where air and water pollution are less likely. Cities overall actually became even more segregated into the 1970s before gradually becoming more integrated. It is still unfinished business holding America back. But it has always been more complicated than that. In all but the most segregated communities, pockets of working class and working poor were always interspersed among socio-economically better off neighborhoods. This has certainly been true of each of the four Durham neighborhoods in which I have lived over the past 26 years. While integrated, they were also never far from highly segregated pockets of poverty. During that two decade transition to integration, even poor neighborhoods segregated, leaving tracts today in every urban area throughout the state with not only a greater percentage of poverty but the least integration. Conditions in these neighborhoods may also be why the most distinctive cause of death in North Carolina is “other nutritional deficiencies,” along with higher rates of obesity and smoking. Inexplicably, while smoking among non-Hispanic white male Americans has fallen from 60% in 1965 to less than 20% today, the percent of males who smoke in poor neighborhoods today remains as high or higher than it was 50 years ago. Worse, cigarette marketers target more dangerous menthol brands to black Americans. Recent studies have shown that low income smokers spend a quarter of their income on cigarettes. Dating to the 1980s with a famous study in Durham, smoking is associated with mental issues such as anxiety and alcohol dependence but not with mild depression. But it was significantly associated with major depression and drug dependencies. It is also significantly associated with the tendency to litter even when cigarette butts are excluded. This may be because depression is about a loss of vitality, leading those who suffer from it to simply not care. This is why proposals to address littering behavior using social media including an otherwise excellent report by some graduate students at Duke are probably misguided because at its essence, littering is due to not caring, including about what other people think. Social media is a tactic, not a strategy. Don’t get me wrong. Peer pressure is what has driven the percentage of Americans who smoke down to 20%. But as I mentioned earlier, in poor neighborhoods, especially among the 25% there who are male and “disconnected” it remains at the level it was 50 years ago. Studies support that it is with this group that efforts to reduce litter should focus, along with efforts to reduce violence and root out poverty. But while they are masters at peer pressure themselves, they are also highly immune to it. This was brought home to me recently while taking a morning walk through a wooded park near where I live. It is encompassed by three highly integrated middle class neighborhoods with one corner touching a highly segregated poor neighborhood. It is a wonderful park with towering trees, a walkway, basketball court, play area and several picnic tables with places to cookout including one under shelter. Each morning when we walk there before maintenance crews arrive, we observe litter such as drink cups left right where people were sitting and trash receptacles that have been deliberately over turned and the contents scattered about. One morning, I asked a young African American worker who was cheerfully picking up litter where he thought it was coming from and he seemed to nod, disgustedly, toward the corner of the park adjoining the poor neighborhood. But as I pointed out recently, in an essay about the new book Cultural Matrix, this and other anti-societal behavior is perpetuated by only a very small minority of residents in any poor community. They are also activists seeking recruits to a value system where it is cool not to work and reject education while perpetuating a perverted sense of masculinity and violent behavior just for the sake of it. They also talk the talk when it comes to American values but fail to walk the walk according to studies in Cultural Matrix. It is not far-fetched to suggest that the majority there who work and seek to become educated in order to escape these surroundings may suffer a form of post-traumatic stress disorder, not from violence but from the constant threat of it. Otherwise, they would be much more effective than law enforcement at curbing the 25% who cause or threaten trouble there according to Patterson. I smiled as I read the response by police in the local paper about why there is a racial disparity in traffic stops. It is very difficult to answer questions when it should be obvious. They make more stops in segregated poor neighborhoods in an effort to target high crime rates there. Duh! Too often we are puzzled about why subjugated populations embrace violence or bribery or corruption when freed, but those who do are merely mimicking the perverted notion of power they witnessed among those who had held them down. But it might be more effective to send in a much larger army of social and mental health workers instead. Judging by experience in the workplace, it may be impossible to change those in these neighborhoods who are actively disengaged, meaning they try to undermine those who are engaged. But this intervention, if intense and prolonged enough, could help the 75% there who want something better and perhaps prevent the 25% from perpetuating the effects of their disassociation on future generations. Chances are that addressing mental health issues it would also be accompanied by a reduction in both smoking and littering there and elsewhere. There are some really smart and dedicated people trying to address poverty. Unfortunately, many closed their minds to causes and solutions decades ago. For anyone who is serious about that endeavor including reporters and editors assigned to news coverage, Cultural Matrix should be required reading. Then why don't you come over to the east side of town? 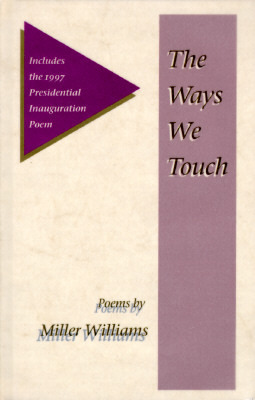 The author’s father, Miller Williams, who you may remember delivered a poem at President Clinton’s second inauguration, passed away last January four days before my mother did, one of his contemporaries.